The TV series, “Afterhours: Live from the Red Cat Birmingham” features nationally known singer-songwriters as they perform acoustic pop and folk music at the Red Cat Coffee House in Birmingham, Alabama, an intimate venue providing TV viewers a front row seat. Season One was produced by Matt Wilson and features Daphne Willis with Korby Lenker, Rebecca Loebe with Lizzy Ross, Matthew Perryman Jones, Charlie Mars, Garrison Starr, Amber Rubarth, and Sandra McCracken. Season Two was produced by Max Shores and features Catherine Feeny, Griffin House, The Clay States, Dar Williams, The Heavy Hearts, Ellis Paul, Lowland Hum, Meiko, Carolina Story, Liz Longley, Stephen Kellogg, Callaghan, and Milow. “Afterhours: Live from the Red Cat Birmingham” premiered on Alabama Public Television’s nine stations covering the state of Alabama in January of 2014. The series was produced by the University of Alabama Center for Public Television and Radio, a service department of the College of Communication and Information Sciences. The department was founded in 1955 to produce programming for the newly-formed network of public television stations in Alabama. Programs were recorded at the Red Cat Coffee House located at 2901 2nd Ave S. in Birmingham. 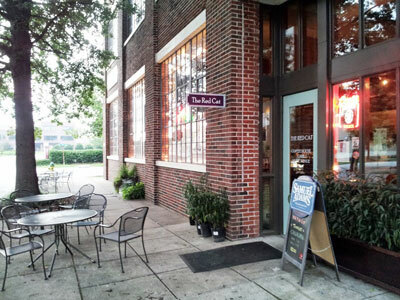 The Red Cat was voted “Best Coffeehouse in Birmingham” for 2012, according to an al.com poll. It is located in the renovated Martin Biscuit Building, part of the Pepper Place district in Lakeview. Production of the programs at the Red Cat offered University of Alabama students an opportunity to gain valuable on the job experience working alongside professional staff. Alabama Public Television is a statewide network of nine stations operated by the state of Alabama. It was America’s first public television network and has broadcast programs which educate, inform, and enrich the lives of the people of Alabama since 1955.